*Free beats. $15 all you can drink Mimosa's $30 all-you-can-eat fancy brunch. At Recreation, everyone loves Sunday Brunch. 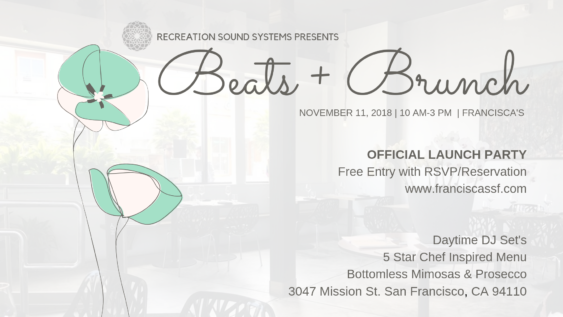 That’s why Recreation Sound Systems is excited to present a new event at Francisca’s. Join as they combine different styles of musical talent with the delectable taste of Francisca’s world-class cuisine. Caprifun will be hosting a bottomless mimosa/prosecco bar and offering custom craft cocktails as well. Advance reservations are highly recommended.